We had covered quite a few free tools to download mp3 songs and music and here is yet another tool to download music from the web! This software is called “MP3 Free Downloader” and it has quite a few features to offer. The software provides access to the week’s “USA Airplay Hot 100”. It also categorizes the mp3 source by genres ranging from pop, jazz and rock to religious, mainstream to indie, hip-hop to classical, etc. The downloaded mp3 songs and music can be played and enjoyed on any mp3 player or smart devices like Ipod, iphone, PSP, and most smartphones available in the market. But not all the features in “MP3 Free Downloader” are free, as its name may suggest. The free version has download limits while the pro tool will let you download MP3 without any limits and with higher bit-rate. 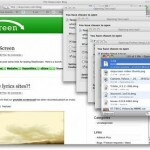 It also makes available batch downloads and some advanced search features. 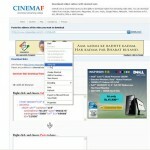 How to download mp3 songs and music? To use the free tool, just run it and search by “Title”, “Artist” or “Album” using the “mp3 search” utility. You have to enter the keywords and click “Search mp3 now” button. For eg., if you wanted the “American chopper theme song” simply enter the phrase and search and you will be shown a list of available mp3 downloads. 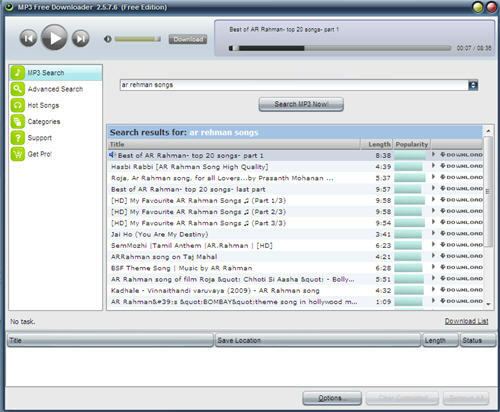 I am a fan of A.R.Rehman and I did a search for “A.R.Rehman songs”. I also found a huge collection of “Ilayaraja hits“. You can also click “Hot songs’ and download any of the week’s “USA Airplay Hot 100”. If you are interested in downloading mp3 of a particular genre, click “Categories” and select the genre. Get mp3 free downloader here. You can check out a few tips to download songs and music via Google search.